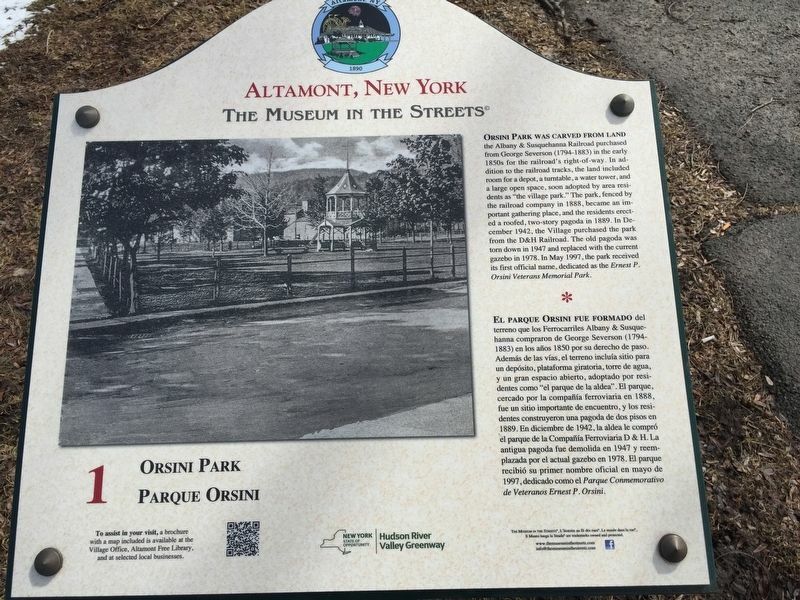 ORSINI PARK WAS CARVED FROM LAND the Albany & Susquehanna Railroad purchased from George Severson (1794-1883) in the early 1850s for the railroad's right-of-way. In addition to the railroad tracks, the land included room for a depot, a turntable, a water tower, and a large open space, soon adopted by area residents as "the village park." The park, fenced by the railroad company in 1888, became an important gathering place, and the residents erected a roofed, two-story pagoda in 1889. In December 1942, the Village purchased the park from the D&H Railroad. The old pagoda was torn down in 1947 and replaced with the current gazebo in 1978. In May 1997, the park received its first official name, dedicated as the Ernest P. Orsini Veterans Memorial Park. por la compañía ferroviaria en 1888, fue un sitio importante de encuentro, y los residentes construyeron una pagoda de dos pisos en 1889. En diciembre de 1942, la aldea le compró el parque de la Compañía Ferroviaria D & H. La antigua pagoda fue demolida en 1947 y reemplazada por el actual gazebo en 1978. El parque recibió su primer nombre oficial en mayo de 1997, dedicado como el Parque Conmemorativo de Veteranos Ernest P. Orsini. Location. 42° 42.075′ N, 74° 1.971′ W. Marker is in Altamont, New York, in Albany County. Marker is at the intersection of Main Street (New York State Route 156) and Maple Avenur (New York State Route 146), on the left when traveling west on Main Street. Touch for map. In park by train station. Marker is in this post office area: Altamont NY 12009, United States of America. Touch for directions. Other nearby markers. At least 8 other markers are within walking distance of this marker. Altamont Free Library (within shouting distance of this marker); Home Front Cafe (within shouting distance of this marker); Dedicated (within shouting distance of this marker); Altamont (about 300 feet away, measured in a direct line); Beebe Harness Shop (about 400 feet away); Inn of George Severson (about 400 feet away); Fire Department/Village Hall (about 400 feet away); Enterprise Building (about 400 feet away). Touch for a list and map of all markers in Altamont. More. Search the internet for Orsini Park. Credits. This page was last revised on March 29, 2019. This page originally submitted on March 26, 2019, by Steve Stoessel of Niskayuna, New York. This page has been viewed 86 times since then. Photos: 1, 2. submitted on March 26, 2019, by Steve Stoessel of Niskayuna, New York. • Bill Pfingsten was the editor who published this page.